Background: Proteomics endeavors to study the structures, functions and interactions of proteins. Information of the protein-protein interactions (PPIs) helps to improve our knowledge of the functions and the 3D structures of proteins. Thus determining the PPIs is essential for the study of the proteomics. 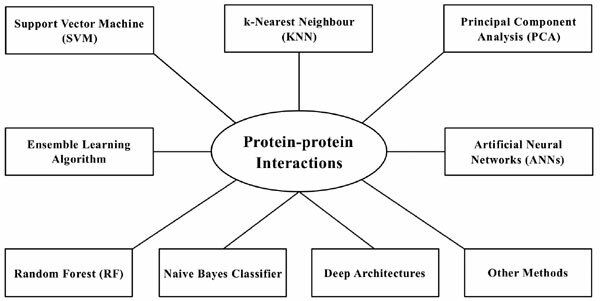 Objective: In this review, in order to study the application of machine learning in predicting PPI, some machine learning approaches such as support vector machine (SVM), artificial neural networks (ANNs) and random forest (RF) were selected, and the examples of its applications in PPIs were listed. Results: SVM and RF are two commonly used methods. Nowadays, more researchers predict PPIs by combining more than two methods. Conclusion: This review presents the application of machine learning approaches in predicting PPI. Many examples of success in identification and prediction in the area of PPI prediction have been discussed, and the PPIs research is still in progress. Ensemble learning algorithm, Escherichia coli, machine learning, Protein-Protein Interactions (PPI), random forest (RF), support vector machine (SVM).